The aim of this book is to present results of scientific research on how digital information should be designed and how artifacts or systems containing digital content should maximize usability, and to explain how context can influence the nature and effectiveness of digital communication. Using a philosophical, cognitive, and technical standpoint, the book covers the issue of what digital information actually is. The text also presents research outcomes from the perspective of research in information science--broadly construed--a term now used to cover a range of theoretical and practical approaches. Part I presents information on how electronic documents can be realized--the complexities, alternatives, functions, and restrictions are treated here. Part II discusses how human beings process information and how technical solutions can satisfy human restrictions. Part III treats the context in which digital information processing and deployment takes place. The book has much to offer to academics in many disciplines, including science, the arts, psychology, education, and the information and computing sciences. 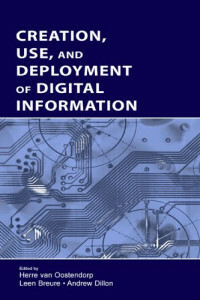 This book is about designing, using, and deploying digital information and digital information systems. It presents research outcomes from the perspective of research in information science, broadly construed, a term used now to cover a range of theoretical and practical approaches to information studies. The far-reaching digitization of society provides the directive for research in information science. Information science is concerned with themes on the intersection of information and communication technology (ICT), on the one hand, and the individual and society in a broad sense, on the other hand. Of special importance is the process of creation of digital content. It comprises important topics such as authoring, information mapping, visualization and 3-D models, and automatic content publishing, with special attention to mechanisms for personalizing the presentation of digital information. (See further, for instance, Stephenson, 1998, for a broad orientation on Web-oriented publishing research in Europe.) Apart from these technological issues, the accessibility of information has become a necessary condition for participating in economic, cultural, and societal processes, both for individuals and for organizations. Digital networks span the world, making a large part of human communication independent of time and place. Information has become the most important production factor and, as such, increasingly determines the functioning of individuals and the structure of organizations. All this has drastically altered the relationships among companies and between companies and their customers, affecting the contact between government and citizen as well. Pro Spring updates the perennial bestseller with the latest that the Spring Framework 4 has to offer. Now in its fourth edition, this popular book is by far the most comprehensive and definitive treatment of Spring available. Due to the rapid growth of digital communication and electronic data exchange, information security has become a crucial issue in industry, business, and administration. Modern cryptography provides essential techniques for securing information and protecting data. Learn about the New I/O (NIO) API introduced in J2SDK v 1.4 that provides new features and improved performance in the areas of polling, buffer management, character converters, and much more.